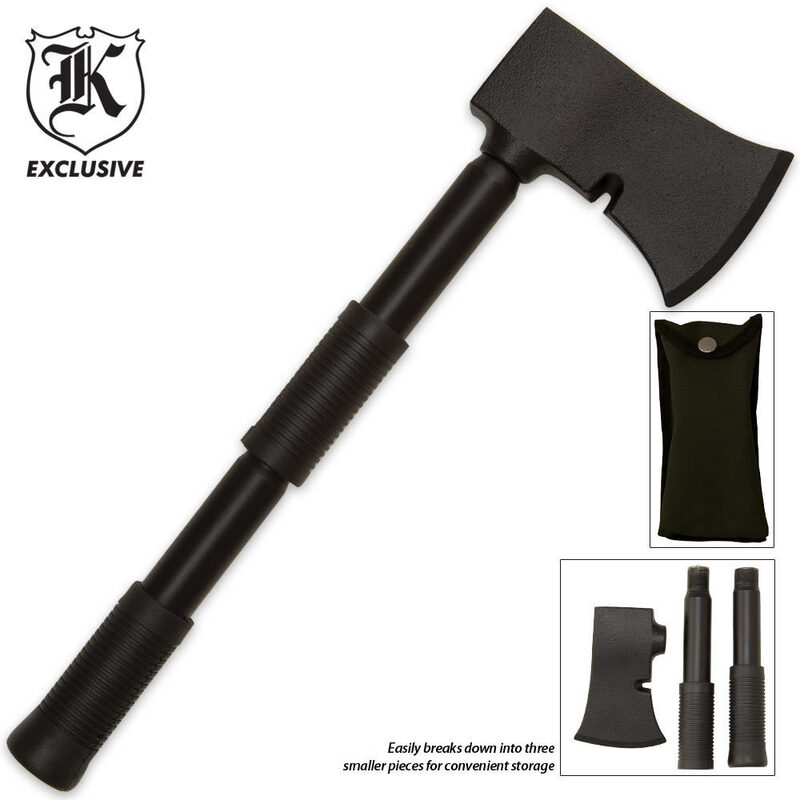 Extreme Take Apart Camp Axe and Pouch | BUDK.com - Knives & Swords At The Lowest Prices! 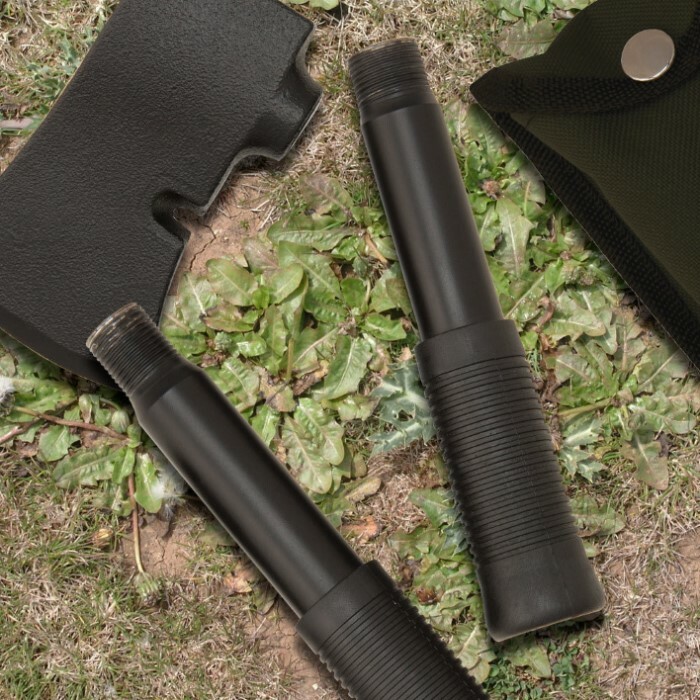 This versatile camping companion is quality steel construction with rubberized grips. This piece also unscrews into a compact size and includes a black nylon-carrying pouch for lightweight transport. 13 1/4" ov, 7 3/8" in pouch. My comment is exactly the same as the other reviews some sharpening is definitely needed but a good tool for the price. OK, $9.99, with penny shipping, 10 bucks! A very good idea. The cons as mentioned in some other reviews, needs to be sharpened, handle made from .060" wall tubing, rubber grips slip on the tube, and yes the head could work loose while using it. The pros, nice knock down design, nice storage pouch, surprisingly hefty with decent balance, nice good old school steel head, and the rubber grips slip on the tube-NOT, a typo, will explain below The weak link is definitely the 1/16" wall tubing, I can see it collapsing if you were really wailing away, but I think if used as intended as a "in a pinch" emergency tool, with a sharp edge, it would do well for gathering 1"-2" firewood, or driving tent spikes. My first thought was perhaps the tube could be strengthened by filling with fiberglass resin or JB weld? I'm going to try that. The fact that the rubber grips slip, works to one's advantage in that if you slide the middle section grip down to the bottom tube, you then have a properly sized main grip of normal length, it, the 2 grips just need be glued to the tube properly. I am going to put a light diamond knurl on my center tube to aid in screwing everything together, (I have a tool to do that in a lathe).You could likely use bike handlebar cloth tape as well Other than screwing it all together tight enough to keep from loosening, you could, 1) pack it with a small tube of blue locktite for use when the ax is assembled, or if oriented to metal work, perhaps a small threaded hole in the head and lower handle tube for a modest size, (6-32?) ny-loc dog point setscrew would do, locations and locking hole determined when the whole thing was tightened up. Its a good emergency, disaster, bug out bag item, OK, as is if used wisely and sharpened, but that actually had the potential to be way better if made a saturday afternoon shop project, worth the coin for certain, glad I purchased it, thanks BUD K, 5 of 5 from me, because the low price outweighs the cons. For the price and it being so compact with a carring case it is a great item and it is at a bargin price. GREAT FOR YOUR SURVIVAL PACK! This axe is a GREAT concept! However, a hard hit tend to make the head come loose. But, there is NO chance that it will come off when if it does come loose, as it is threaded quite deeply into the axe head. I will put this together permanently with some Thread Lock and keep it under the seat of my SUV with my Gerber Gator to be a little more prepared for the coming Zombie Apocalypse!!! LOL! RETAILERS, this item is an excellant concept BEWARE it comes in unsharpened. The buyer must have access to a GRINDER of ALOT of time with a file. Individual buyers it is a great item just be aware of the situation.